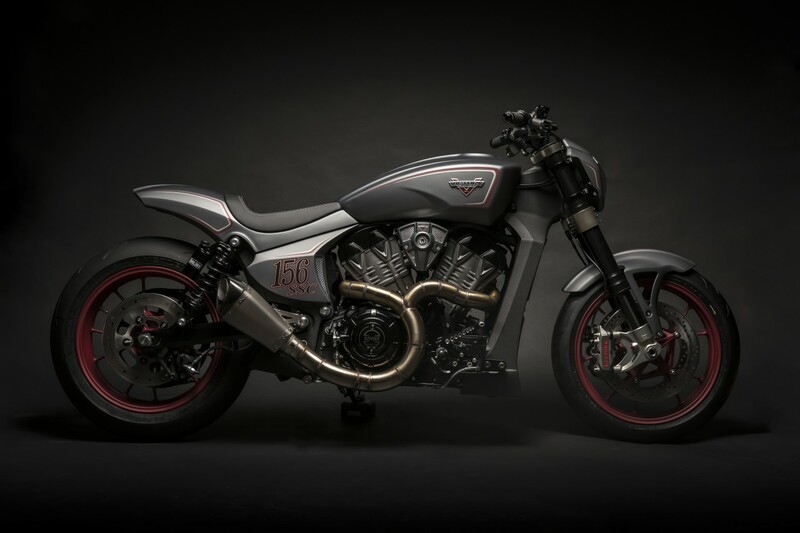 Victory Motorcycles today revealed the production version of the engine that powered Project 156 up Pikes Peak this summer. It further announced that this engine will power an upcoming 1200cc class motorcycle. The engine has been designed to deliver the strongest power and performance in its class and was shown off in a concept motorcycle built by European builder Urs Erbacher. Erbacher is well-known in the European custom motorcycle scene taking several top awards and gaining international attention. Erbacher’s concept – dubbed the “Victory Ignition Concept” was custom built around the first pre-production engine off of the line in Osceola Wisconsin. The concept features an aggressive stance and frames the engine with a cast aluminum chassis, performance suspension and brakes with a Project 156-inspired paint scheme. The liquid-cooled four-valve engine has a 60-degree vee angle, utilising double overhead cams that promise to make class-leading power. Additional details of the engine will be revealed in the months to come.